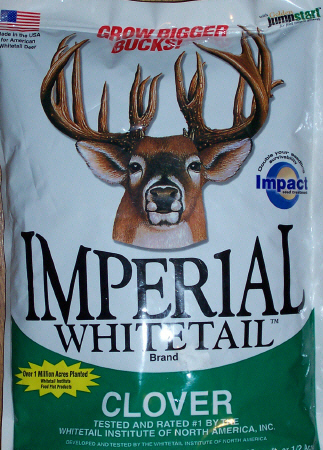 Imperial Whitetail Clover is a professionally formulated blend of high yielding clover varieties that offers very unique traits when compared to traditional plantings for wildlife. Wildlife biologists now know the critical importance of high-quality forage and browse for whitetails year-round, especially during the spring and summer months of antler growth and fawn development. Without high-quality, high-protein browse during the antler-growth season, a buck's antlers will not reach their genetic potential. Like humans, a deer's available diet seldom supplies all of the minerals, vitamins and protein necessary for maximum good health and growth... Whitetail Institute of North America has changed all of that. There is a clover product that has been developed specifically for Whitetail deer and wild turkeys. Imperial Whitetail Clover is a revolutionary breakthrough in plantings for wildlife. As the result of years of painstaking efforts, Imperial Clover is the first clover product developed specifically for deer and wild turkey. NOTE: Amounts under 18 lbs will not be in the original Institute bag, the seeds are purchased in bulk and re-packaged to order. printed instructions included. 1. Follow all instructions below, step-by-step, when planting Imperial Clover. 2. Stay within the planting times for your state on the back of your Imperial Clover bag. moisture. If possible, avoid sandy soils, hilltops and hillsides that drain quickly. 5. Soil test for a Giant White Clover to determine fertilizer and lime requirements. acre. A heavy application of lime can maintain a neutral soil for several years. 6. Disk ground thoroughly to prepare good weed-free seed bed. 8. With a good seed bed prepared, broadcast 8 lbs. or more seed per acre. smallest setting on most hand spreaders. can’t graze that area. Watch the difference inside and outside the basket. 12. Do not plant during hot/dry weather. performance and longevity from your Imperial Whitetail Clover food plot(s). your clover with bush hog to clip the weeds and clover down to about 4-6 inches. will help you get the best and longest life from your Imperial Clover planting.